The U-Drive (UD) is a very low-cost industrial GUI controller, ideal for OEM applications requiring a user interface. 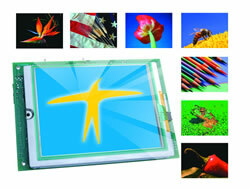 The ultra-bright, wide viewing angle active TFT color display with touchscreen is attractive, and easy to program. Other peripherals on the board makes this board a powerful and comprehensive industrial user interface and control solution. The onboard LCD controller (S1D13075, EPSON) has internal 80KB image buffer, supporting QVGA color graphic LCDs with 320×240 pixels. The integrated TFT display is ultra-bright (rated at up to 750 nits), with brightness controlled by external DC power input (8-11V). An accurate touch screen controller (ADS7846) supports 4-wire resistive touch screen. All components are installed on single PCB, mounted on the backside of the QVGA TFT for easy integration into user applications. Comprehensive, user-friendly software libraries and samples are provided. User can easily design their custom functions keys, text, logo, and graphics. Supported by the CompactFlash-based file system (up to 2 GB), 20 user screens can be displayed per second via DMA transfer. A Host USB controller can be installed to provide two Host USB ports. Port 1 can interface to USB keyboard/mouse, allowing a flexible mechanism for accepting user input in addition to touchscreen. Port 2 supports a hot-removable USB flash disk, using a simple command set to manipulate a FAT filesystem format. No other USB specific firmware programming is required on the controller side. A Controller Area Network (CAN) controller (SJA1000, 20 MHz clock) is available. It supports network baud rates up to 1M-bit per second. Software drivers allow access to all CAN controller registers, as well as a buffering software layer. A Fast Ethernet Module can be installed to provide 100M Base-T network connectivity. 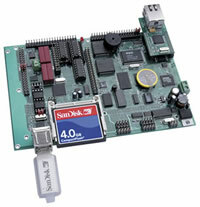 This Ethernet module has a hardware LSI TCP/IP stack, implementing TCP/IP, UDP, ICMP and ARP support in hardware. Socket-based software drivers allows the U-Drive to be used as a web or SMTP server. Also available are 4x RS232 and 2x RS485 serial ports. There are 30+ TTL I/Os, 4 mechanical relays(200V, 0.5 Amp. ), 4 opto-couplers and 14 solenoid drivers (sinking/sourcing 350 mA at 50V each). The solenoid drivers can be hardware configured to be high voltage (0-30V) inputs. Three 16-bit CPU internal timer/counters support timing and external counting. 4 ch.16-bit parallel ADC chip (AD7655, 1 MHz, 0-5V), 24-bit ADC(LTC2448 C5KHz C0-1.25V) configurable for 8 ch. differential or 16 ch. single-ended input channels. A 12-bit ADC(TLC2543, 10KHz C0-5V) provides 11 ch. analog inputs. Eight ch. 16-bit DACs (LTC2600, 0-5V, 10 KHz), and four ch. 12-bit parallel DAC (DA7625, 200 KHz, 0-2.5V) are available. 4 mechanical relays, 4 Opto-coupler inputs. NOT including options. OEM option discounts available.